The name Burgess Hill is found as early as 1524 (Mitchell/Shell Guide p88), but development did not start until after a station was opened in 1841. 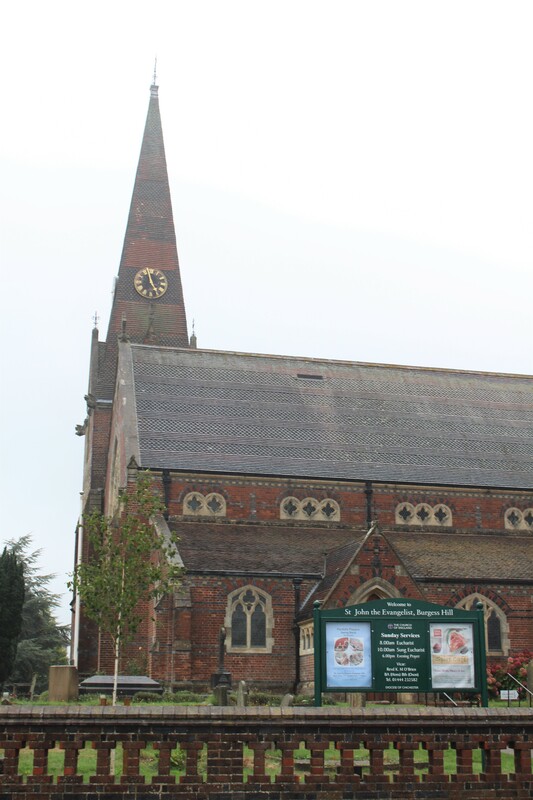 Previously divided between the parishes of Clayton and Keymer in an area best known for its brick and tile works, a new church, St John’s, was started in 1861. 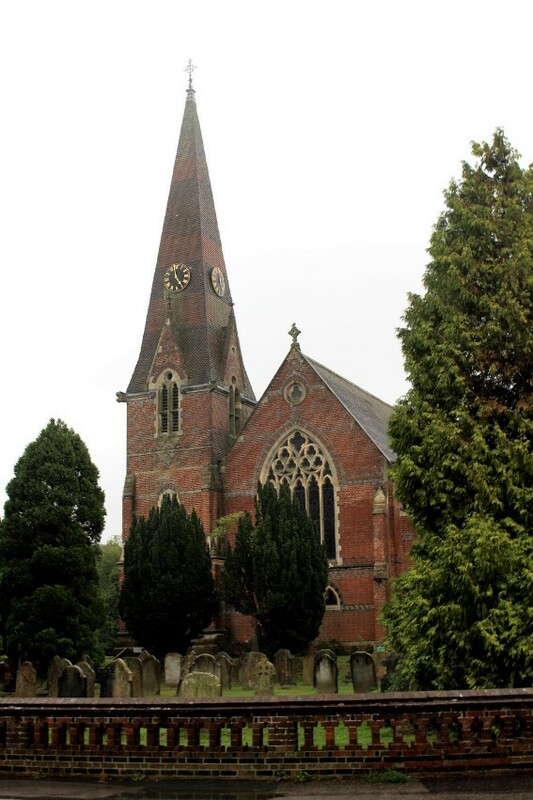 In the later C19 and in the C20 it was for a while the fastest growing town in Britain and more churches were built (see St Edward and St Andrew). Designed by T T Bury (B 19 p787), the foundation stone of St John’s was laid in 1861 and it was consecrated two years later. It is a large church and today it dominates the northern part of the centre of the town, despite the competition of supermarkets and office buildings. Bury used polychrome brick, though this only remains outside. The word that comes first to mind is ‘ spiky’ – the north aisle has a series of cross-gablets and the clerestory to the south consists of groups of pointed quatrefoils. The north west tower has large bell-openings in long gables, breaking into the base of the tall spire which has the curious feature of clock faces half way up each side, whilst large angels lean out precariously at each corner of its base. The south aisle, added in 1875 by Bury (ibid 33 p61), has a lean-to roof and is less strident. There was an enlargement costing £1200 (KD 1899) in 1889, when there was a further application to the ICBS for a grant, using designs by E J Hamilton. This was rejected and the lack of any other obvious later addition suggests this can at most be a reference to the vestry said to have been added in that year (EH). Vestries were normally outside the remit of the ICBS, which would account for the rejection. Unsurprisingly, the proportions of the church inside are tall, notably the chancel arch which is also wide. There is said to have been a west gallery until 1910 (church website), but today the effect is disappointingly bland, for the deliberately subdued detail was intended to be offset by Bury’s polychrome brick and tile, of which there are traces below suffocating C20 cream paint. Even the original pulpit, now gone, was of coloured brick (ibid 21 p483); probably this was locally made. Font: 1911 (CDG 209 (1911) p89), with red marble columns. 1. (South window) Kempe and Co, 1927. 2. (West window) Kempe and Co. Though the person commemorated died in 1899, it was apparently only installed in 1931. Like much of the company’s later glass, there is too much plain glass around the figures. 3. (North transept, east window and aisle windows) Mayer and Co of Munich, between 1885 and 1895 (Arch J 3 p109). 4. (South transept south windows) Lavers and Barraud, 1883 (www.stainedglassrecords.org retrieved on 4/2/2013). Monument: (in churchyard) John Edwin Nye (d1915) by E Gill, 1917 (E R Gill p48). Pulpit and Lectern: C E Kempe, but said to have been made by Norman and Burt (church website); if correct, this is unusual since fittings designed by Kempe were generally made by his own company, though Norman and Burt did work elsewhere for him on more obviously structural projects. The pulpit no doubt replaces the brick one mentioned above. Reredos: Carved and arcaded with much foliage. The designer is not known, but as Norman and Burt are said to have made other fittings in the church (ibid), they may well have made it. Kempe is also a possibility as designer. Rood screen: Handsome, probably made also by Norman and Burt.